When the Saturday Club of Wayne celebrates the 69th anniversary of its founding next Tuesday, March 29, it will be doing honor to one of the most outstanding women this community has ever known – Katharine Barling Longstreth Sayen. It was Mrs. Sayen who, in an era when women’s clubs were almost unknown organizations, invited to her home on West Wayne avenue “on a sunny Saturday afternoon” early in the year 1886, “several bright congenial women, who, over steaming cups of tea, dared to discuss the subject of women’s clubs, then almost a tabooed subject.” And when on March 27, 1886, the Saturday Club adopted its constitution and by-laws, there was indeed in the entire state of Pennsylvania but one other departmental woman’s club, the New Century Club of Philadelphia, formed from the Women’s Committee of the Centennial. lt is on Tuesday, March 29, the 1955 meeting date of the club closest to that memorable March 27, 1886, that the Saturday Club will hold its annual birthday luncheon party. As usual, it will be a gala event, set against the background of spring flowers and candlelight, all enhanced this year by the freshly decorated interior of the clubhouse. 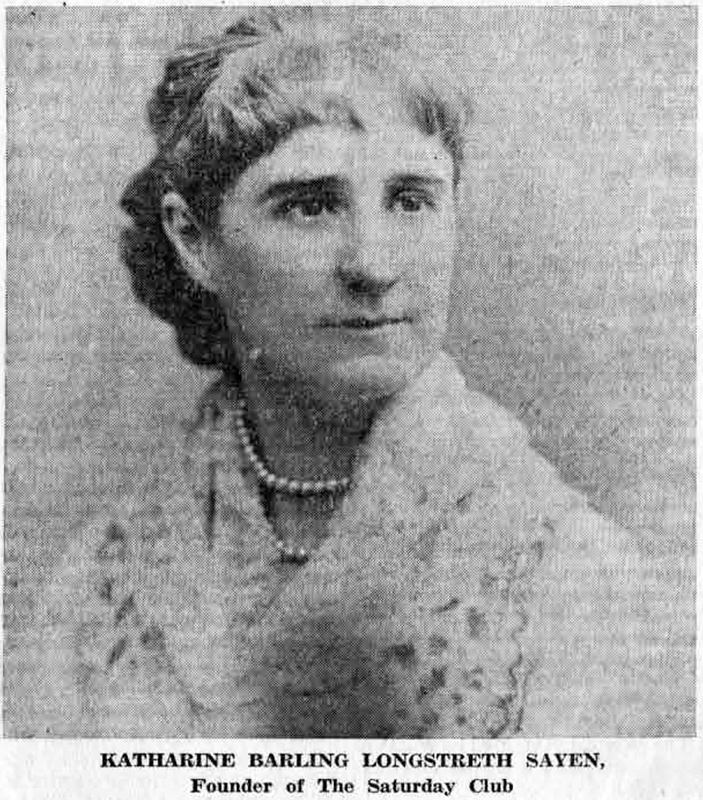 Katharine Longstreth Sayen was in the forefront of a movement that, in the last quarter of the 19th century, was to be responsible for much of the position and privilege of women today. No words written in 1955 could perhaps so well express what was taking place then as those of Mrs. George R. Stocker’s inaugural address when, in the spring of 1891, she was made president of the Saturday Club. But even before Mrs. Stocker’s presidency, the Saturday Club was taking part in this ever widening “club movement for women.” In October, 1890, its president was requested to attend a meeting of the General Federation of Women’s Clubs, which was just then being formed. And a few months later the Saturday Club became a member of that Federation which is now the most powerful and influential group of organized women in the world. With its membership in the United States and with its affiliated membership in foreign countries, this group now number more than six million women. The Saturday Club was also a founding member of the Pennsylvania State Federation of Women’s Clubs when it was organized in 1895 under its first president, Mrs. Ellis Campbell, of Wayne, a former Saturday Club president. Looking back over the vista of almost 70 years we try to envisage the woman who was responsible for the Saturday Club’s early part in this great organization of women throughout the world. That Katharine Longstreth Sayen was a beautiful woman is evidenced by the picture shown above, a picture that, along with the first Minute Book and the first Treasurer’s Record, is among the Club’s most cherished possessions. And that she was a much loved woman is evidenced by the memories of her, held not only by her children and her grandchildren, but by all who knew her. Mrs. Sayen was also a woman of widespread interests. Among Wayne’s other institutions, besides the Saturday Club, which will always bear the imprint of her early efforts, is the library, for the establishment and maintenance of which she worked long and faithfully. Still remembered by a few of the older residents of the township are the plays she gave to help raise funds for the purchase of books and equipment for the library. She was also deeply interested in the welfare of the community in which she lived. There is a story told of her concern for the children of foreign-born parents, where the father was employed in the quarries in Wayne. It is said that she regularly gathered these children into her home on West Wayne avenue, where she gave them some elementary instruction in the language of their new homeland. 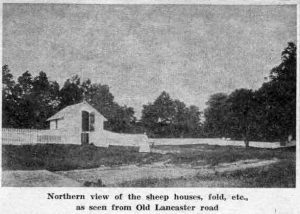 Her house still stands at the intersection of West Wayne avenue and Conestoga road, where it is now the club house of the Society Italian-American Club. For the young people of her family and their friends there were always Saturday afternoon tennis parties in season, in the spacious grounds surrounding this house. And for this same group there were dancing classes at the Saturday Club, sponsored by Mrs. Sayen. And so, next Tuesday’s gala day at the Saturday Club will pay tribute not only to Katharine Longstreth Sayen as its founder, but to a woman who will long live in the memories of a community which she loved and served in so many ways. This week’s column returns to the 1928 copy of “The Main Line Beautiful” magazine, given to us several years ago by Miss Harriet E. Weed, from which we recently used two stories with their accompanying pictures. Today we turn to an early picture of Windermere Court, one of the most popular apartment houses in this vicinity. Even to your columnist, who has made her home in Windermere Court for some years, it came as a surprise to learn that the intention of the property’s original owner was to sell the apartments, rather than rent them. But, according to a Wayne realtor to whom we showed the booklet, “selling apartments was quite a stunt when Windermere Court was built.” Unfortunately for the success of this plan, the depression of the early 30’s was just around the corner and it was difficult at that time to rent the apartments, much less sell them. In a double page advertisement in the middle of the “Main Line Beautiful” magazine, there is shown the picture reproduced for this column. 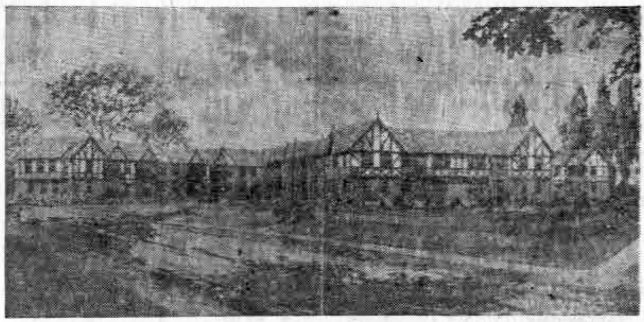 It has an unusual look to those who are familiar with the setting of Windermere Court, probably because the architect has not shown the elevation of the Windermere avenue side of the apartment house, where the first floor apartments are almost on a level with the second floor rooms of the Wayne Grammar School across the street. The site of Windermere Court was at one time known as “the Rose property.” Later the house was the home of the Joseph Stockwell family. It was demolished when Windermere Court was built. “What will probably prove to be the most popular apartment house on ‘The Main Line Beautiful’ is Windermere Court, located at the corner of beautiful Louella and Windermere avenues, Wayne. “The structure is of a modified English style of architecture and overlooks the campus and athletic field of the new $400,000 Radnor High School. The location is ideal – churches, stores, clubs and railway station being almost within a stone’s throw, and numerous golf courses within a convenient distance. “The interior of this beautiful new apartment house has been planned to bring about the height of efficiency, convenience and beauty. Every room has plenty of light and sunshine and each apartment an unobstructed outlook of beautiful terraced and landscaped lawns. Each apartment has its service entrance, a kitchen completely equipped with ventilated cabinet gas range, electric refrigerator, domestic-science cabinet and the most modern fixtures. Ample closet space is provided, including a cedar lined closet in each apartment. Floors are of hard wood, and each living room has a Murphy-in-a-door bed to provide emergency sleeping accommodations. “Laundries, completely equipped with modern appliances and especially constructed drying apparatus are available for the use of tenants. There are individual storage rooms and a number of maids’ rooms and bath for those with servants. Maid, janitor and porter services are available. All apartments have direct telephone communication with the resident superintendent’s office, and hot water and heat from a thermostatically controlled oil heater are supplied. Underneath the main wing and central court is a large and especially fire-proofed garage, providing convenient housing for the occupants’ cars. Roy G. Pratt was the architect of these “cooperative apartments” and the late Fred H. Treat, prominent Wayne real estate dealer, was the general rental and sales agent. From the book of priceless old pictures which Herman P. Lengel has lent to the Radnor Historical Society, and from which pictures for this column have been reproduced from time to time, the first one shown in the book is that of the railroad station. 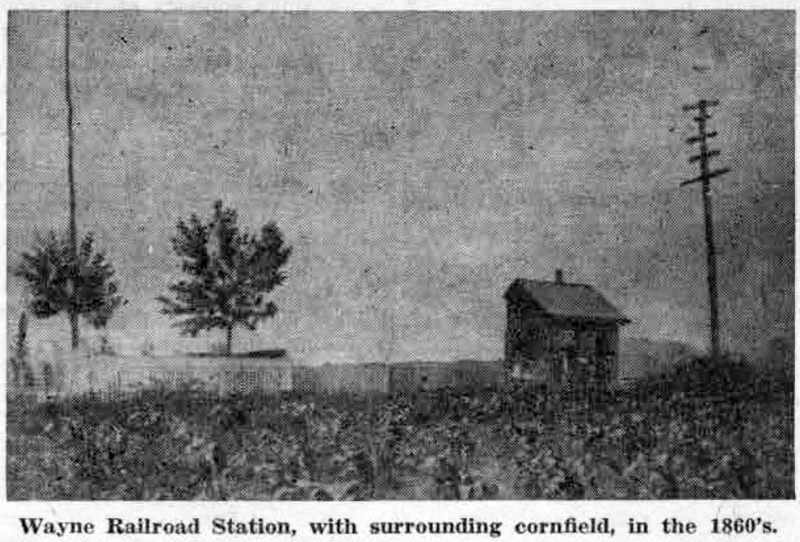 In the 1860’s, the station provided the first view of Wayne for most newcomers. The small edifice shown in the picture above might be called the third station, in point of time. The first was a large, square wooden pillar, laid on its side, where passengers sat while they waited to flag the train. The second was an old wagon bed. By the middle 1860’s, when Mr. Askin was building his Louella Mansion in the middle of his farm lands on the old Lancaster Highway, the present Pennsylvania Railroad had built double tracks along its Main Line. In Wayne the tracks ran somewhat to the south of the present road bed. Joseph M. Fronefleld, Jr., father of J. M. Fronefleld, 3d, wrote in some of his reminiscences of Wayne as he knew it in the 1880’s, that “Hall lane led directly to the station from the intersection of Conestoga road and West Wayne avenue.” Hall lane was so called because it started from Radnor Hall, a small place where public meetings were held, located on the site of the recently demolished First Baptist Church, at Conestoga road and West Wayne avenue. It “went in a northeasterly direction from the old church… passed over the ground where LaDow’s Drug Store (now Sun Ray Drug Store) and Lienhardt’s Bakery stand, crossed Lancaster pike diagonally, passed over the ground upon which the Presbyterian Church now stands and terminated at the station. The station was close to the point where the back of the Waynewood Hotel (now The Wayne House) stands.” Your columnist has often thought that this is the explanation of the fact that the front of the Presbyterian Chapel is not on a line with either the pike or the Presbyterian Church. When it was built, it undoubtedly faced on Hall lane. After the Wayne Presbyterian Church acquired possession of the former Wayne Hotel, the frame building pictured above was demolished. Standing to the rear of the hotel, it had for some years been used as sleeping quarters for servants of the hotel. And so passed into oblivion one of Wayne’s old landmarks, its first real railroad station. At any rate, tradition has it that for many, years the approach to Wayne’s railroad station, with its adjoining cottage, was through a large cornfield! 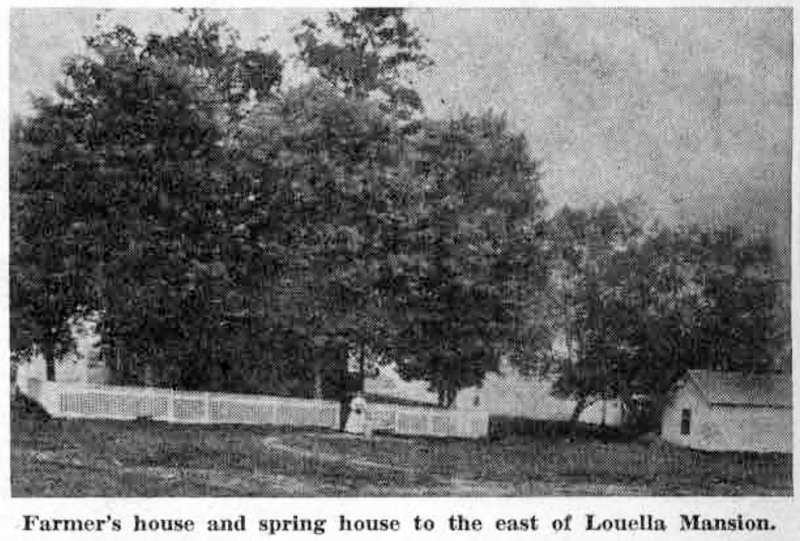 The other two pictures illustrated in today’s column show spring houses located along the Lancaster pike in the 1860’s, the first (above) being located to the east of Louella Mansion and on the same side of the highway. 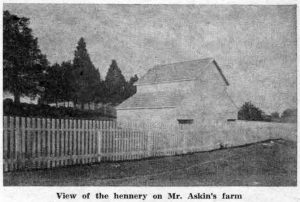 Although no description is given in the old book, both the residence in the center of the picture and the spring house to the right were, undoubtedly, the property of Mr. Askin. 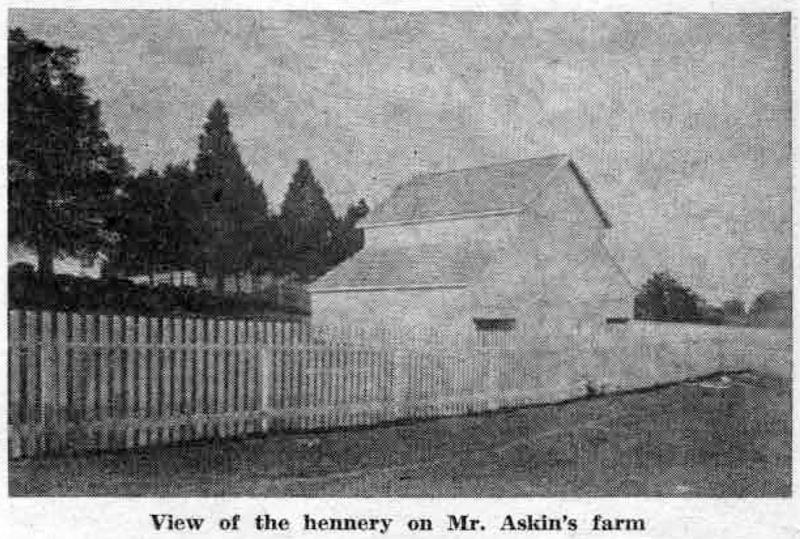 The former was probably the picture of the home of one of the farmers, with the farmer’s wife standing at the gate of the neat picket fence, with the large milk can in front of her. The spring house at left was across the pike from its farm house, since the latter is identified in the table of contents as the large house on the north side of the pike which is now the home of Walter B. Lister. The Barber farm house was later the Presbyterian parsonage, and still later, the home of the Lofland family. A subsequent note on this picture places the spring house as being located in the rear of what was for many years the W.A. Nichols home. 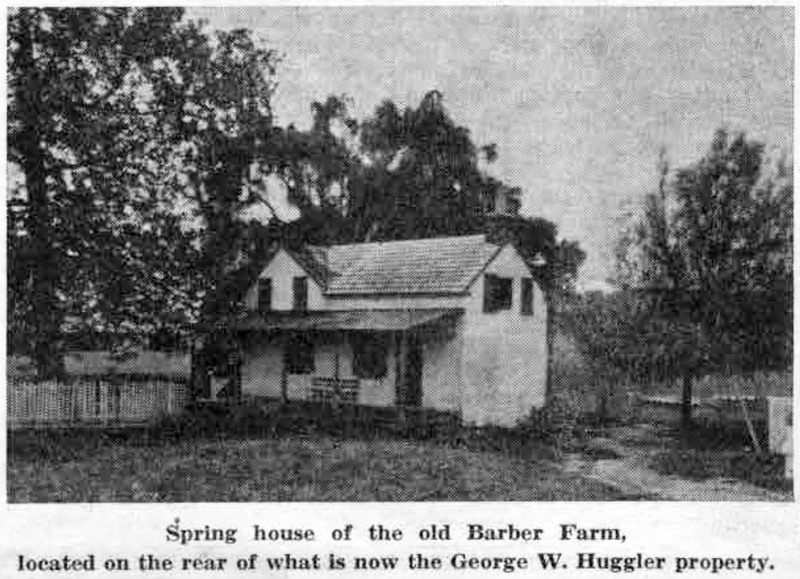 Located on the south side of the 400 block of Lancaster pike, this house is now occupied by the George W. Huggler family. 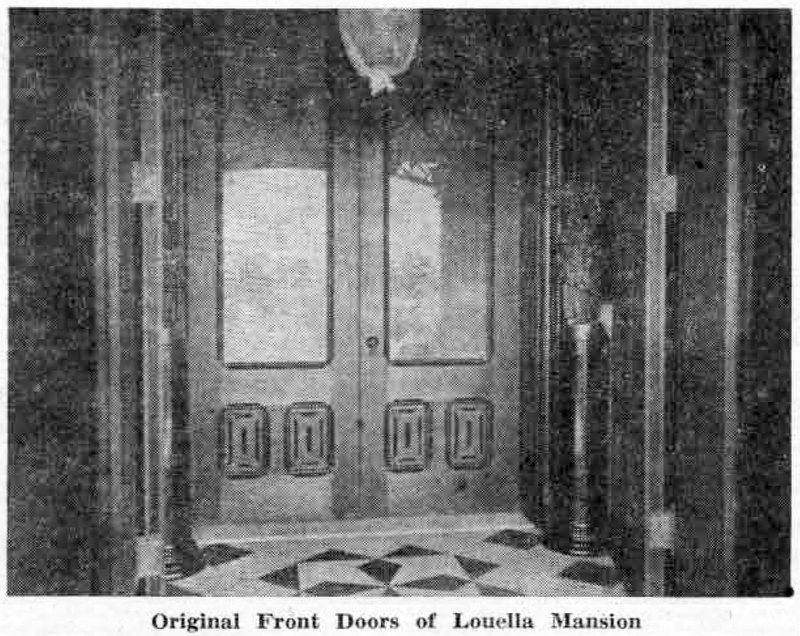 After seeing the various pictures of the exterior of the old Louella Mansion, shown from time to time in this column, it is particularly interesting to have this detailed one of the front doorway, which faced directly south, with a view of the then narrow Lancaster pike and the farmlands beyond. In all of its details this picture is indeed an interesting one, showing as it does the real elegance of the architecture of the period in which Henry Askin built one of Wayne’s outstanding landmarks, now almost 80 years old. The delicately etched glass of the doorway has intricate beauty of design extending the entire length of the panel. The original picture from which this newspaper reprint is taken shows clearly a secondary picture, the reflection in the glass of part of the terrace gardens. Flanking the inside doors, on either side, are stone pedestals on which bronze figures are mounted. The tiled floor has a large geometrical design, probably in black and white. One amusing note in the midst of all this elegance is the mosquito netting covering the large glass globe of the vestibule light, which undoubtedly served the purpose of keeping the globe from becoming fly-specked! Although the size and arrangement of the rooms had to be altered to some extent when the building was made into an apartment house the height of the ceilings was not changed. Because of this feature, and the fact that many of the rooms are still large ones, the present tenants are opposing many of the alterations recently proposed by the owners of the building. 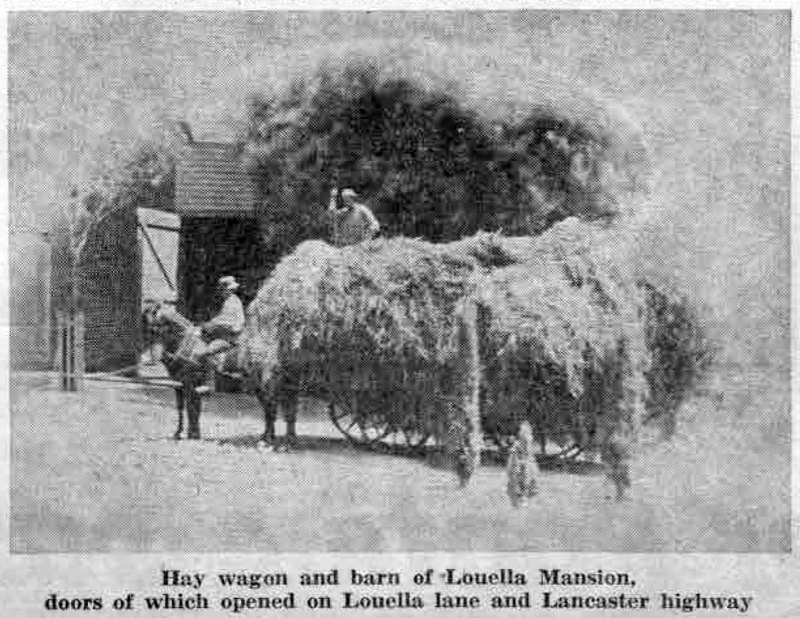 But even though the Louella Mansion of Mr. Askin’s time may have vied in elegance with any of the large contemporary Philadelphia houses, its surroundings were rural, as has been shown in the other three pictures in this column. 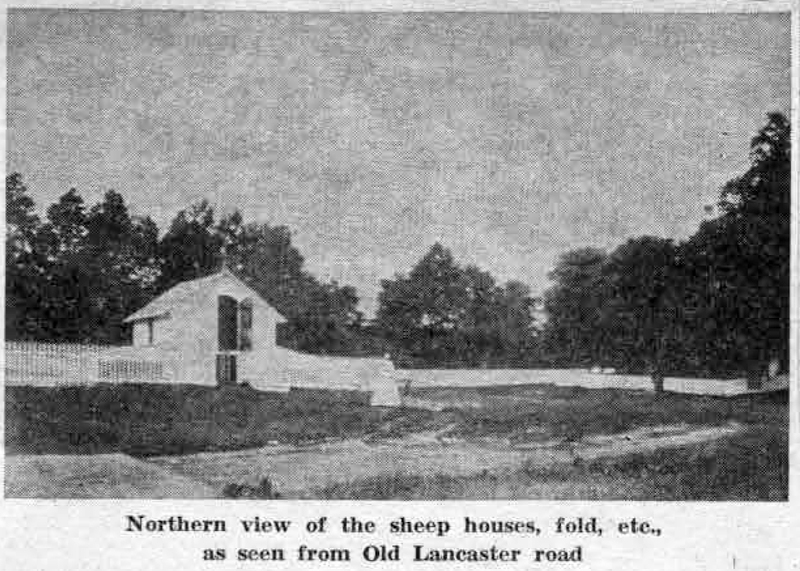 The hay wagon with its “rustling fragrant load,” as it is described in the index, might have belonged to any large farm; the sheep pen with its neat white picket fence was a model of its kind, while the hennery, with more of the white fence around it, was equally adequate for its purpose.